Here is my step-by-step guide on how to declutter your wardrobe! I’ve pulled together tips and tricks + my process and mindset when I go through my closet. I typically declutter my clothes every few months and use this guide to help keep everything streamlined and on the smaller side. I’ve been doing this about two years now and love it! You can read my thoughts on having a small wardrobe here! Pull all of your clothing out of your closet, dresser, even the laundry hamper (don’t forget to include socks, underwear, gym clothing, and even pajamas in this process) and place into a large pile. Do not leave clothes in drawers or hanging in your closet. I find that when I leave clothing in the space that it lives, I glaze over it and never get to see each item to make an objective decision. Placing all of your clothing in a large pile allows you to see exactly how much you own and nothing can hide. Create three piles: Keep, Donate, Maybe, and begin to sort everything accordingly. While going through your closet, there are a couple of things to keep in mind. Three Months: Ask yourself if you have worn the item in the last three months and if you picture yourself wearing it multiple times in the next three. If not, pass it on. Function: If you are aiming for a smaller wardrobe, realize that it needs to be ridiculously functional: each piece that you keep should be easily swapped between multiple outfits. For myself, if I can’t picture an item in 3-4 outfits I would wear on a regular basis, I don’t keep it. How You Feel: I’m a firm believer that each item you own should make you feel amazing. Only put things in the “keep” pile that are an immediate “yes!”. Anything that makes you feel uncomfortable, unattractive, or just bleh should go. Guilt: Never keep an item out of guilt. Either out of money spent, or because it was a gift. If you don’t absolutely love it, there is no reason to hold on to it and allow it to take up space. Sentimental Items: Allow yourself to part with sentimental items. If you wear camp or concert t-shirts on a regular basis, keep them! But if you are storing dozens of them in a drawer and never touch them, take this as your cue to say goodbye. If an item holds a lot of sentimental value but you never wear it, think about stashing it in a memory box instead of your closet. Extra Loungewear: Don’t repurpose items to wear around the house, as extra pajamas, or to workout in. You probably own enough of this type of clothing already, it doesn’t make sense to add to this category when we are trying to simplify. I kept a massive amount of this type of clothing when I first started to declutter. Even though I had so much, I always ended up wearing the same few things off of the top of the drawer that made me feel the most comfortable, leaving the rest untouched. Let these items go and keep your favorites that you wear on a regular basis. Damaged Items: Don’t hold on to items that are damaged or need alterations. I used to have piles of these clothes that eventually got pushed to the back of my closet to be forgotten about. My rule is that if I can’t repair or alter it within a week, it’s not essential to my wardrobe and it is alright to let it go. The Maybe Pile: This pile is important and a great opportunity to put things you are truly indecisive about to the test. I put anything that I’m not instantly excited about, but feel like my closet would have a big gap in it - think, old winter boots that are useful but kinda ugly, or the one and only little black dress that you own. 03 | Organize. Donate. Store. Once you have gone through everything, store away your “keep” pile and donate any items you no longer want. Put your “maybe” pile in a storage box and hide it somewhere in your home. For me, if I can think of a specific item I need back in my closet, I grab it out of this box to put back in my wardrobe. However, I typically find that I forget about the box and can’t recall any of the items inside. When this is the case, I usually take my storage box directly to Goodwill after a few months - I figure if I can’t remember the items, they must have not been that important! While I encourage you to be ruthless in editing your closet, be smart about the future of your wardrobe. For me, when I initially cleared everything out I realized I was missing key items: I must’ve owned nearly a dozen winter coats of all different cuts, styles, and colors, but not a simple, neutral colored one that could be worn with multiple outfits. Instead of keeping all my coats, I donated most and invested in a versatile black coat that I’ve now worn for years. Keep in mind that you may have to pull from your “maybe” pile, and that’s okay, that is why it’s there. Or, If you are in a position to repurchase a few items and fill in those gaps, I highly encourage you to do so slowly and thoughtfully. There have been several occasions where I thought I desperately needed an item, quickly purchased it, and regretted it a few weeks later when it was left untouched or barely worn. 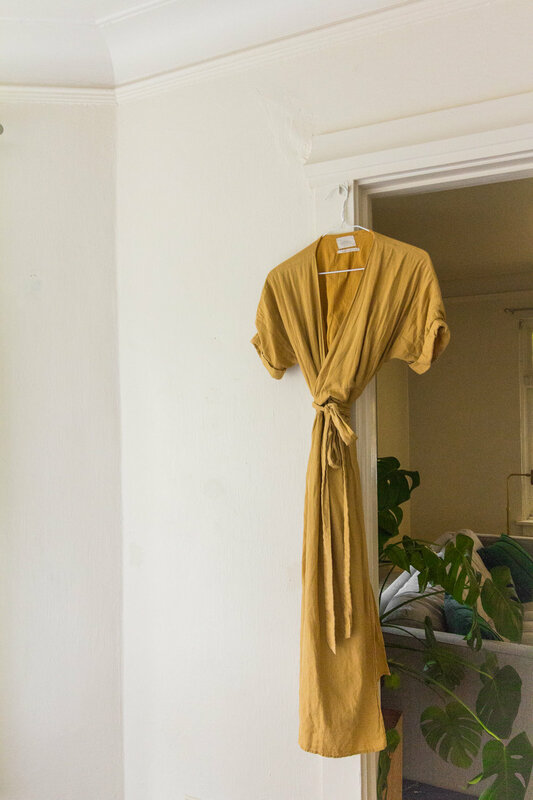 The whole idea behind a curated closet is to only keep items you absolutely love, so make sure the ones you bring into it are of the same caliber and truly necessary. I think most of you will find that you already have exactly what you need in your closet and will have so much fun dressing up with less to choose from. Let me know if you declutter your wardrobe and send me a photo on Instagram! I would love to chat with you!